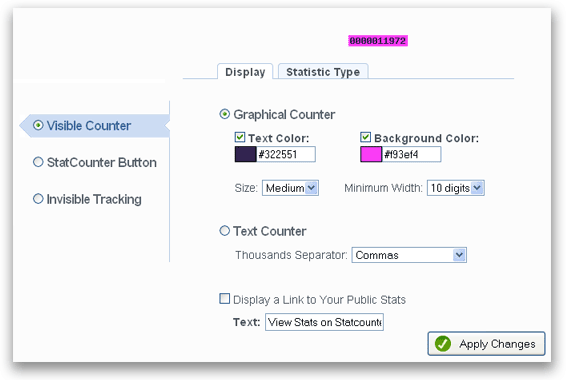 Just how configurable are our free hit counters (also known as web counters), and why should you use one? Firstly it is completely optional whether to display a counter or not. We track your visitors for free and you can choose to go completely invisible. No ads! Most members however, freely choose to display a hit counter because the level of configurability is just so damn good. If you do go for the counter option - then that's all that will be displayed. Your perfectly configured hit counter! We do not add on any of our own advertising to your counter. It's your website - you know what works and looks good. We always prefer to give the control to you - the webmaster. Are you transferring over from another web counter service? You can set your starting counter number to begin where you left off with your old provider! Choose between displaying unique visits or page loads. Specify precisely the background and digit color for your counter to blend in perfectly with your website. It gets even better than that - if you want to place your counter over an image on your website, you can set your background or digits to be transparent. Allowing the image on your website blend in very nicely with your counter. There are 5 different sizes to choose from, and you can instruct how many digits long you want your counter to be! We are damn proud of the configurability we offer. Please show me someone else who offers all this for free or even paid! ?